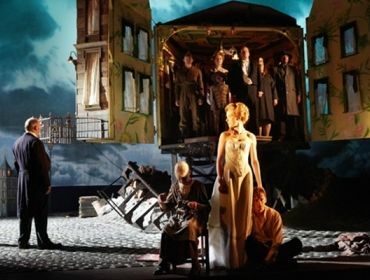 For those studying it in school, An Inspector Calls should (like it did for me) fill a young reader with fascination and a ravenous desire for more theatre. This production of the show has exceeded 20 years of touring and is a mighty theatrical achievement in anyone's books. The play's placement on the school curriculum could be held accountable for the success of this show, but it is a devilishly good night at the theatre either way. 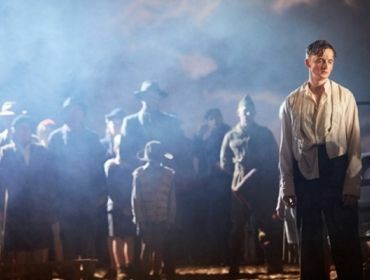 "One of the great theatrical moments of contemporary theatre"
The production wrestles between both World Wars, as the characters float between both time periods; the set being also iconic, remaining totally impressive. The opening to the show is one of the great theatrical moments of contemporary theatre: Blitz children linger on stage (sirens are briefly heard), one child turning on the wireless and then attempting to lift up the theatre taps (curtains). As rain pours onstage, the children dart around and the Dream Sequence from Bernard Hermann's score for Vertigo blasts out. The moment is staggering and leaves many a goosebump. The opening of the Birling house is also another special moment, as it unfurls to reveal a grand but miniature dining room. The house collapsing towards the end of the drama results in sparks, bangs and much broken crockery, or, as John Cage once said, "I was fascinated, since everything was going wrong." Themes of the work are heavy, though never laboured. One thinks of responsibility, the power of your actions and empathy, which we can often lack at crucial moments in other people's lives. Eva (who possibly used aliases) appeared to be a victim of circumstance, but if there is any truth to the events that happened, then the Birlings really did do her in, one by one. It's an incredibly crushing tragedy. "Ten steps ahead of everyone else"
Liam Brennan is our Goole (one wonders on the "ghoul" aspect of the name? ), an acute, Scot Inspector, who is ten steps ahead of everyone else and with great bravado. He reveals the interplay of each character by getting it out of them. Caroline Wildi is Sybil Birling, beyond posh and indeed a stern, cold character to take on. Her husband, Arthur is preformed by Geoff Leesley, doing a perfect Northern accent and making him out to be the no-nonsense father figure businessman he truly is. As Gerald Croft, Matthew Douglas is the loveable and calculating toff, soon to marry Sheila, here played by Katherine Jack. She is said to be the most sound character, giving many insights into the events taking place. Jack achieves this and she appears to be the only one to be little affected out of all of them (her apparent encounter with Eva was brief and petty). Hamish Riddle is Eric, the youngest, who is very feisty and is easily becoming a boozer. The character is alive with youthful error, which has real consequences, and it's his personality that quickly becomes quite sour. On this night, the theatre was stuffed with eager school kids and their rustling of sweet wrappers. It was a very excitable audience, which murmured and went along with all the things that were flung at us. It nice to see that. Perhaps younger people should go to the theatre more often (as long as they are quiet). 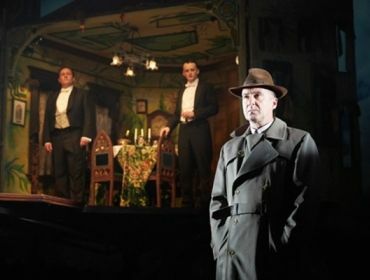 An Inspector Calls continues at the New Theatre till 16th April 2016.